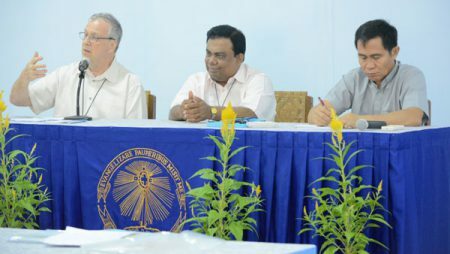 The Joint Session between the Asia-Oceania Regional Conference (AORC) and the Central Government was held at Wisma De Mazenod (Oblate Post-Novitiate Formation House), Yogyakarta, Indonesia, on March 21-30, 2019. Eleven members of the Central Government and 14 members of the AORC were in attendance. 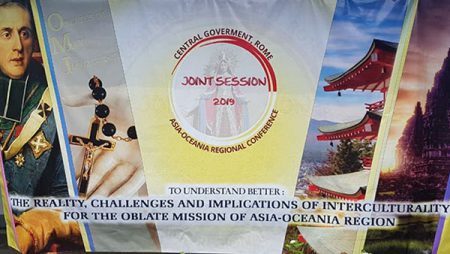 Its general theme was: To Understand Better the Reality, Challenges, and Implications of Interculturality for Collaboration in the Oblate Mission in the Asia-Oceania Region. A delightful ceremony consisting of traditional Indonesian dances, rituals, food, and drinks welcomed the participants, courtesy of young students and lay people associated with the Oblates in Yogyakarta, and the young Oblates in formation. In the inaugural Eucharist presided by the AORC president Fr. Edwin SELVARATNAM, Provincial of Jaffna Province, he spoke about care and concern for the members, exercised with great sacrifice and commitment, as part and parcel of leadership. Words of welcome were given by the host Provincial Fr. Eko SAKTIO of the Province of Indonesia, AORC President Fr. 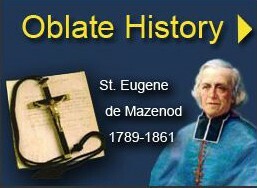 Edwin, and Superior General Fr. Louis LOUGEN. Father General reminded all about the objectives of the Joint Session, especially about strengthening the bonds of fraternity and evaluating the actions on the mandates of the last Chapter. He also expressed the desire to listen to stories of successes and challenges in the mission from the units of the Region, marked by diverse contexts and rich cultures, religions, and traditions. 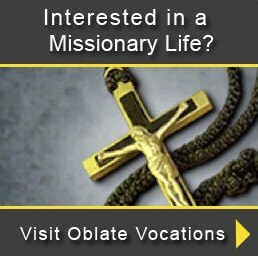 Oblate life and mission in this vast Region. 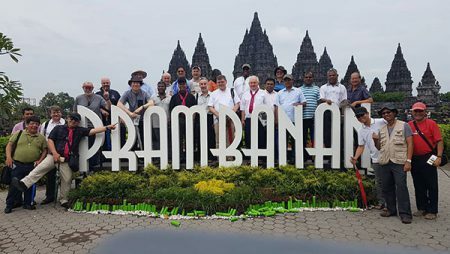 On the day when the two groups joined in meeting, Indonesian Jesuit Gregorius Budi Subanar introduced the topic of Interculturality, mainly from the realities of the Indonesian Catholic Church. The participants then reflected and shared on this theme throughout the day. The succeeding days focused the attention on the issue of increasing the level of collaboration in the region, particularly in the areas of religious life, mission, formation, ministry with youth, lay associations, and finances. In the end, the Joint Session produced 12 main proposals for concrete collaboration in these areas, and passed these on to the AORC for implementation, in coordination with the Central Government. Father General presided the closing Joint Session liturgy, at which also four novices of the Province of Indonesia received their religious habit to formally begin their novitiate year. 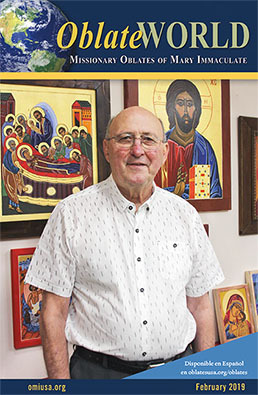 The joyful and helpful presence of the Oblate pre-novices, novices, scholastics, and Brothers, and lay people who worked behind the scenes, contributed to a successful Joint Session.